Australasian Debating Championship 2018 Univ. Negeri Semarang | SMA Sederajat | Deadline 21 April 2018 | Lomba.co - Selanjutnya datang informasi lomba dari unnes kawan dimana sedang mengadakan lomba debat 2018 dengan tema australasian debating championship. Adapun persyaratan peserta untuk ikut perlombaan ini adalah pelajar SMA sederajat ya, diluar itu kalian tidak dapat mendaftarkan diri. Ayo tunggu apalagi langsung siapkan team terbaik kalian dan menangkan hadiahnya. Get ready for the next High School debating SHOWDOWN! EDS UNNES proudly presents, AUSTRALASIAN DEBATING CHAMPIONSHIP 2018 with the theme “Increasing awareness to achieve sustainable development goals by critical discourse and spirit of internationalization”. We invite all the students of SMA/SMK from Central Java and Jogjakarta to come join this competition. Registration is open now! 1. Fill the registration form from Bit.ly/ADCREGISTRATION2018. 2. Submit the form when you’re finished. 3. Complete the registration by paying the registration fee which as follows, IDR 360.000/team. Transfer your payment fee to 1270-01-012211750-4 BRI A/n Virgina, followed by confirming your payment to 085877689596 (Ega) by WhatsApp. 4. After you’ve finished all 3 steps, you are now officially registered as a contestant of ADC UNNES 2018! Don’t miss a chance to win; millions of rupiah, trophy, certificate, and many more. Register now, because we only have limited capacities of 40 teams! 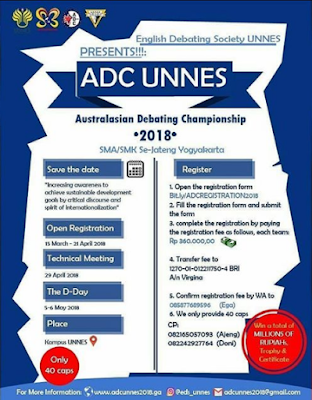 Belum ada Komentar untuk "Australasian Debating Championship 2018 Unnes"